Today is the beginning of National Child Protection Week. I received a forward that reminded me of it and it held a very powerful poem and photos inside that I wanted to share with my readers. All children deserve to be loved and sometimes it takes outsiders to protect them from those that are supposed to be giving them the world. There are many organizations out there that have more information about helping prevent child abuse, NAPCAN is one. 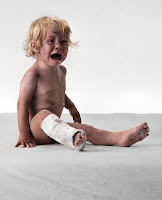 Please, please, please don't let child abuse go unreported!!! Gayle Jones Staples, 1975 ? That poem made me cry. It is very powerful.